I have been pondering the question ‘What is my ethos?’ for months – no for years – really ever since I first started thinking about ‘theorists’ for my level 3 qualification – way back in the mists of time – to be honest in the last century! (so before the year 2000 in case you are thinking that I am very old). However before I return to the subject of theories and how they fit in with my ethos – I think I will start with my own personal ethos that governs not only my working life but my personal life as well. I am a very honest person – and being honest is important to me. I can not cope with lies, or withholding information or with using information creatively to benefit self or even the organisation that you work for. I accept that sometimes what I might call a white lie or withholding information to benefit another person or prevent them from being upset or hurt – can have a place. Being so honest does not always ‘sit well’ with others – including family members. Sometimes I have ‘dug myself a hole’ by refusing to sit back and allow others to do or say things which I know to be wrong and I know have the potential to hurt others – little things like keeping things found without even trying to return to the owner, like dropping litter, like driving when on the phone and so on . It may also be easy to see why I am not comfortable with the things I see, I hear and I read about about the practice of a minority of other childminders – and why if I think a child is at risk – I will phone the safeguarding board or in extreme circumstances the police. I hasten to add that I expect parents of minded children, family, friends, colleagues and neighbours to report me if they think the children in my care are at risk of harm. Ok so I have now defined my personal ethos – what about the ethos of my childcare practice? Back to those theorists. After all those years of reflection about which theory I have been influenced by – I have come to the conclusion – all of them but none of them in their entirety and some of them just a very small aspect. SO my ethos and my ‘values and practice’ are based on the – Webb Theory! Of course I don’t expect anyone else to believe in this theory or to follow it – after all I think we all have our own ‘theories’ that have been influence by other theorists – and by the others in our lives such as parents or foster careers, teachers, church leaders and so on – and of course our own life experiences. And it should be remembered that the more modern theories have also been influenced by previous theorists and bits added and taken away until a ‘new’ theory evolves. Children learn through play and the best ‘play thing’ is an adult who is in tune with the child’s needs and who has time to interact with the child. Children learn through their senses and by ‘doing’ and through experimenting and their own mistakes. Children need unconditional love and someone who will ‘be there for them’ no matter what has happened or is happening. Children do not need need to experience all aspects of life or a curriculum before the age of 5 – they need to be allowed to be children, to become secure in the foundations of learning – all those social and emotional skills, those self management skills like dressing, feeding self and toileting. Once they are secure in these areas – they will be ready for more formal learning, to flourish and to in due course reach their full potential. Testing and labeling of children is wrong -all children learn at their own pace – reading and writing at 5 does not mean the child will do well in later life nor does not reading or writing until 9 or 10 mean a children will fail to achieve their full potential. Children will continue to surprise and amaze me – and I think they always will – they are all unique. So there we have it – they Webb Theory – It may not be very academic – it is very likely that others will not agree – but it is my theory – and on which, together with my personal ethos, I based my values and practice. Posted July 31, 2012 by psw260259 in Random Things! My ‘in my head’ planning said we would be going out to Witley Court which is an English Heritage property about 25 mins away and a lovely place for a walk, a picnic and to watch the fantastic fountains. Bonus being that as I am English Heritage member, the mindees and I can go as often as we like without any entrance fees. As it happens my ‘in my head’ planning went out of the window as Archie was not feeling quite himself – not ill – no need for calpol or to send home – just in need of extra cuddles – and extra understanding when disagreements about toys occurred. So instead we stayed at Penny’s Place and got on with the serious but fun task of PLAYING. Today play centered around the wooden heuristic items with a lot of moving between containers, stacking and sorting going on. Of course being children they ‘added’ extra things to their play from the continuous provision – magnetic cars, the teddy bears (from our topic – so Daddy Bear, Mummy Bear and Baby Bear. So as I say an ordinary day – but wait – thinking about it – my ‘in my head observations’ say otherwise! Alex is extending his play – last week he was lining his cars by colour – today he has very carefully selected cars that are the same – so fire engines, trucks etc placed together. To do this he went from storage basket in the one room, selected a vehicle, carried it to the other room and added it to his line – he repeated this for each vehicle – and he most definitely did not want any help from the other children – nor did he think my suggestion to move the basket of vehicles into the room with his line of vehicles a very good idea either! He had his plan, he knew what he wanted to do . When another child did try to use one of the cars – Alex demonstrated his increased understanding of turn taking – because instead of just snatching it back or throwing himself on the floor in protest about the ‘loss’ of the car – he said to the other child ‘1, 2, 3 – give it to me’ OK, still not fully there with his understanding but a huge step forward. And for the first time since starting potty training Shona did not have any washing to take home – so maybe (only guessing) the talk with teddy was more to herself and reinforcing messages from parents and Penny? So on reflection – maybe not just an ordinary day – in fact I have to ask – is any day when looking after children ‘an ordinary day’ in my experience there is always something that they say or do that is far from ordinary – and causes me to do a ‘in my head observation’ – which of course means I have noted their development. Of course – I have photo’s of some bits (as included here), I have made brief notes in the child’s diary (the one I keep here for my evidence) AND I have told the parents verbally / shown them the photo’s AND they have signed the child’s diary to confirm I have told them the things recorded on that day’s page. 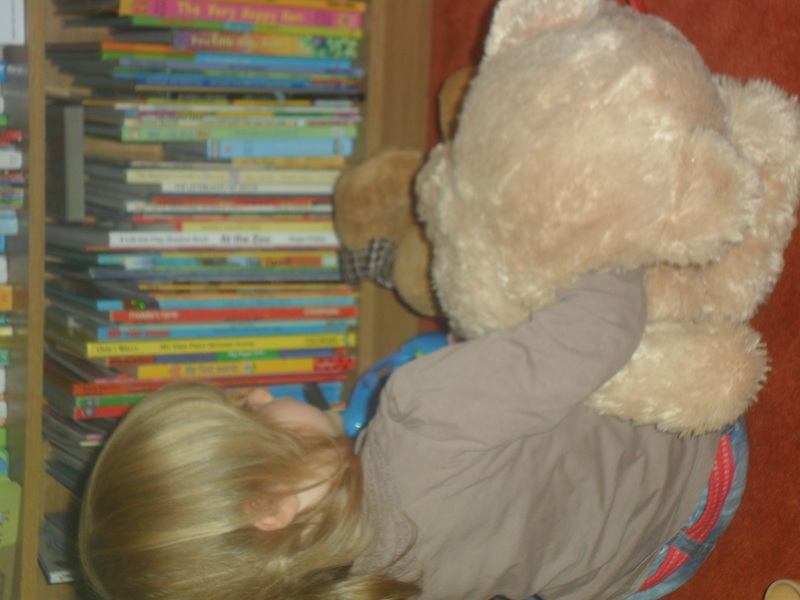 Well today is the day that I have 5 under 5 mindees for the first time – from !st September 2012 I will be able to look after these mindees on my own under the new ‘exception’ rules of the revised EYFS. Please see my separate post on changes to the variation request under current EYFS to the exception rules under the revised EYFS. Anyway for today I am required to have an assistant or co minder to maintain the conditions of registration and numbers of children, but as none of them are free – my friend Carol who provides holiday relief – and who only has one child in her care today – will with permission of from parents, be in charge of Erin during the hours that number exceed my current variation, but spending the day at my setting so all the children can be together. The day gets off to a noisy start as myself and the three mindees present just after 8am take part in ringing bells to start the Olympics. We have Radio Two on very loud so we can hear all the bells in London over our own bell ringing. Each mindee choose a hand bell and took a full and active part – in fact they were so good they were given a second hand bell each so they could make even more noise (sorry neighbours). There was much laughter, jumping up and down and general excitement – and that was just me – you should have seen the children! 3 minutes was not long enough for us so we played all through the next song as well. Afterwards Alex recalled in detail what we had done and specifically mentioned the ‘loud bell’ on the radio. The children then wanted to go outside – and were excited to find that some black feet shaped pieces had been added. They quickly got to ‘work’ making a a line of wooden circles (as before but not described as snake today) and a trail of feet shapes. To complete ‘the look’ they added some chalk marks on the ground. Carol and the baby A, then arrived as did Chinzia, so we were now all there – 2 adults – me and Carol, 6 children – Baby A, Archie, Erin, Alex, Shona, Chinzia. I put the kettle on – but for some reason never got round to making the drinks – it was much later that Carol said’ I’ll make a drink then shall I’!! One of the most popular items today was the cardboard tubes (from the scrap store of course). The children discovered that they could ‘wear; them on their arms and walked around with a tube on each arm – all holding arms out (well hard to do do anything else with tubes on your arms) but some were aeroplanes and some were robots. Of course these clever and inventive children found more uses for the tubes:- they rolled them on the ground, and posted things in them – Baby A some pine cones which Erin then joined in with squeezing as many cones in as she could, Alex posted some small wooden cars into a number of tubes that were stood upright in a box- and Alex also managed to balance the tubes on top of each other to make a tower. At one point Alex removed himself from the group play and was ‘found’ under the children’s table playing – in his words – ‘driving car’. Early this morning I was planning the outdoor environment ‘in my head’ – which is about as much ‘forward planning’ that I ever do! Can’t see the point myself in spending hours thinking about possible activities, themes and so on – months in advance – and then adding the details on a weekly or even daily basis. In my opinion – how can we possibly know in advance what the children’s interests will be or even in detail their exact stage of development? And whats more – what a waste of time to then change the planning because of the limits of forward planning or even having to cross out all the neat referencing to the development matters statements because the children do something other than what you intended them to do. Sorry I am rambling – or maybe I am not? So back to this morning and my in my head planning. On my way up the side passage with the dog after our morning walk (well this morning very quick dash) – I almost fell over the sand table and the lovely movable sand toys trolley (influenced by FECCERS – which in my opinion is a useless assessment tool but a fantastic self audit tool – more on that another day) – and that got me thinking – no not FECCERS – falling over the sand table – why not add sand into the environment along with the shells and containers? In my head I congratulated myself – supporting interests, possible schema’s – and extending play / offering different opportunities – no wonder I am judged outstanding! The day starts well some lovely play (sorry no photo’s as children in them all). Chinzia who has been on an extended holiday for 2.5 months staying with grandparents in Romania returned and very happy to see us all and settled to play quickly (only one slight difficult – she is speaking mainly in Romanian – and I have a vocab of just 2 Romanian words! ). All well until Archie arrives – and I go into kitchen to prepare Archie’s breakfast – I can see and hear children, but journey from garden to kitchen means they are out of sight for about 30 seconds. As I enter the kitchen and look out of window I am in time to see sand flying through the air and covering Chinzia!! The thrower will remain nameless but was ‘spoken to’ about the dangers of sand throwing and Chinzia who was of course upset was telling me all about it – in Romanian – and I was comforting her in English. Luckily a cuddle works it magic in all languages. At this point I was not considering myself outstanding at all – and was doing some ‘in the head’ reflecting!! Luckily we were going out a bit later to our favourite place – Arley Arboretum – so sand throwing was not an issue (for the time being). We met with our friend Carol and her Mindees, had a great time and a picnic lunch – and as a treat ice lollies for the children, and coffee and cake for Penny. After yesterdays sorting counting and using containers, I thought I would set up a similar environment outside this morning – but with added items to see what the children did with them. So to the selection of plastic containers, cones, pebbles, wooden circles, balls and bean bags – I added seed trays and pot trays (as from garden centers), some shells and some large tubes (pipes). Then waited to see what the children did. I was not disappointed Shona took the wooden circles placed them carefully – including telling her friends where to put them when they wanted to help and made what she described as a ‘snake’. As a group of 4 two year olds they then explored the shell collection – picking shells up and examining them and describing them (and bringing the ‘best ones’ to show me). After a while they carefully arranged the shells on one of the wooden circles – as you can see in the photo. Further collections of things and arranging of things then took place, again as can be seen in the photo’s. To test out my blogging skills (which are some what lacking at this stage) today I am going to try adding some photo’s. 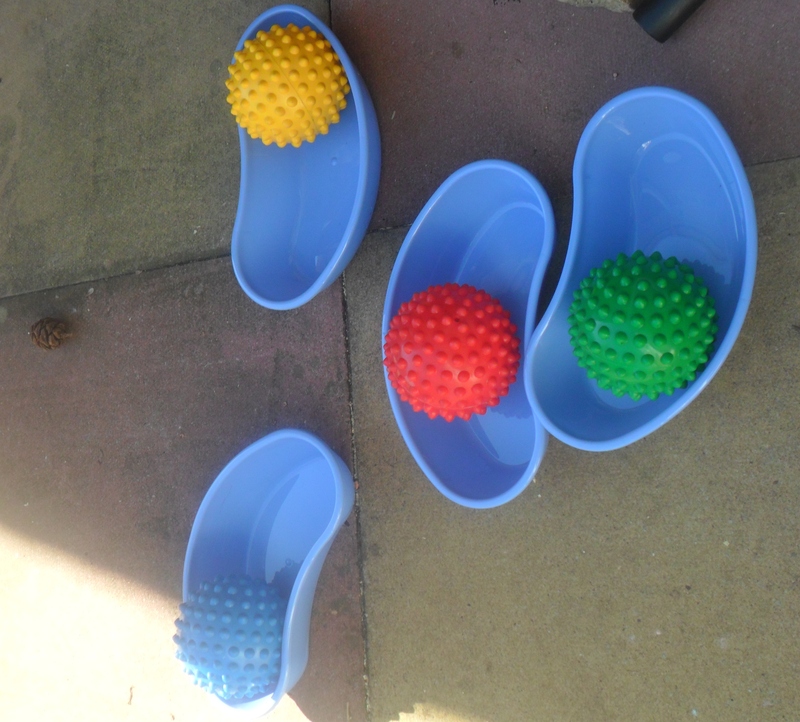 Here the children decided to place balls into the blue containers – note one container / one ball and although the balls are different colours they are the same size and type. 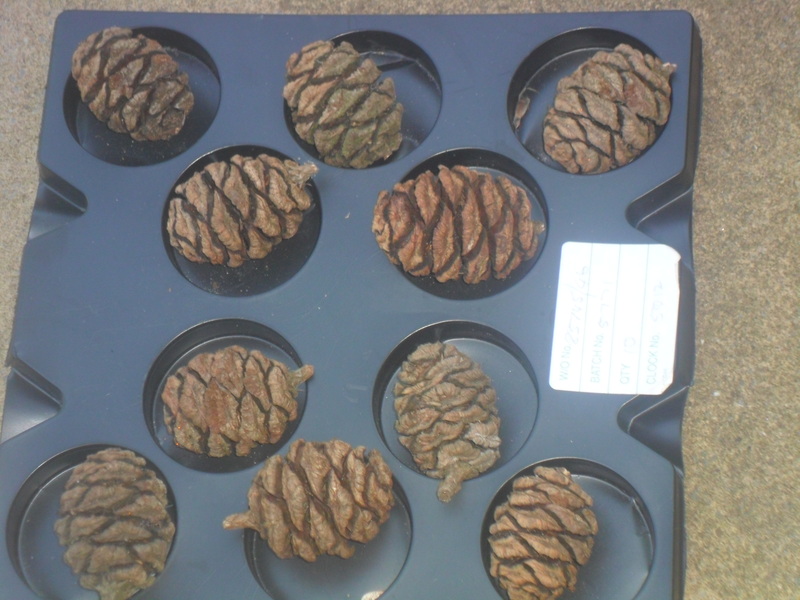 Later on I noted that the children had places pine cones into a container with ‘holes’ – again one pine cone to one hole. During the afternoon the children wanted the paddling pool out again – but soon abandoned the pool when asked if they wanted to help harvest the early potatoes. 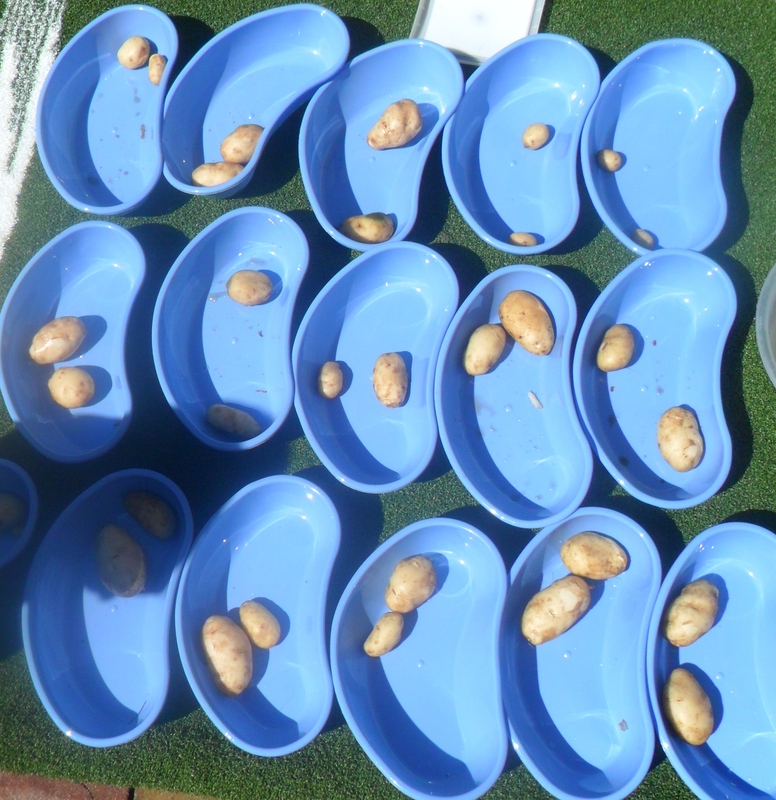 I decided to offer a next step opportunity and asked the children if they would like to put the potatoes into the blue containers to dry (after I had washed them). They did ! – and quickly piled potatoes into a couple of blue containers. I then suggested that they children put just two potatoes into each container and introduced ‘one more’ and ‘one less’ to help support their counting. Alex quickly grasped the idea and was able to select two potatoes without counting and then check he did have two by counting them into the container. The girls Shona and Mia needed a little more practice and support but did succeed in putting two potatoes into their container. Well the highlight of today was first use of the paddling pool this summer. The children were so excited and jumped in even before the warm water had been added ! There were squeals of ‘Cold’ ‘ Cold Penny’ but no one want to get out and it did not stop then tipping water over themselves and each other. My grandchildren Dominic 8, and Scarlett 7 months joined us for the afternoons play. Scarlett sat and watched and sucked on some melon while Dominic helped the little one experimented with filling a tube with water and adding things to see id sunk or floated. When they realised the plastic ducks would fit in the tube and then ‘by magic’ rise all on their own inside the tube – they had to do it again and again!